CAMBRIDGE, Mass. — Prime Minister Justin Trudeau remembers asking his father why the stereo and other gadgets he had as a boy were made in Japan — not in Canada. The answer he eventually got from other people over the years was that Japan is a small country without a lot of natural resources, one that had to massively invest in its people through technology spending and education. “I remember being really pissed off,” Trudeau said Friday at an innovation and sustainability conference at the Massachusetts Institute of Technology. 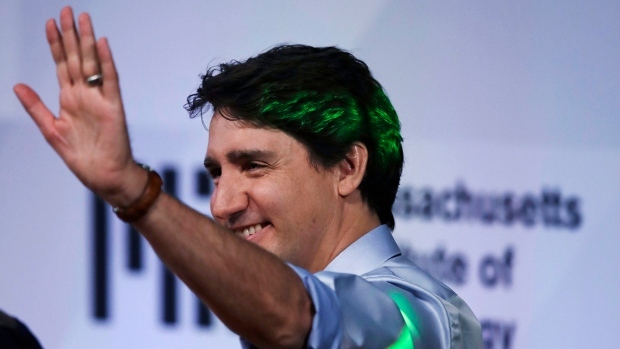 Trudeau said Canada now relies heavily on technology and innovation in harvesting its natural resources, but he added it has also learned that resource development alone cannot drive the country’s economy. The question-and-answer session with MIT professor Danielle Wood was the final event of Trudeau’s three-day trip to the United States, where he focused largely on selling Canada as a solid place to invest. The Bank of Canada warned earlier this week investor confidence has been hit by concerns about the progress on negotiating a new North American Free Trade Agreement. Trudeau’s trip came at a tense stage of those talks between Canada, the United States and Mexico. An artificial deadline to complete a new deal came and went on Thursday, and there are now serious questions about how much longer it will take and what impact elections in Mexico and the U.S. will have on progress. Technology was named as a Canadian strength by several people Trudeau met with or spoke to during the trip, many of whom mentioned Canada’s welcoming immigration policies and openness as a competitive feature held up against a lens of protectionism and slowdown of immigration in the United States. Earlier this week Trudeau delivered the commencement address at New York University and talked up Canada with more than a dozen American CEOs and pension fund managers. It was Trudeau’s 16th trip to the United States as prime minister, given that his tenure has been dominated by U.S.-Canada relations — largely due to the election of President Donald Trump and his shifting trade policies. He told the students in Cambridge, Mass., on Friday that Canada is investing significantly in education, basic science, commercial science and technology, including artificial intelligence. Following the discussion he toured some of MIT’s technology labs, and got a demonstration of AI robots run through a programming system designed to teach children. Trudeau voice-trained the robots to respond to comments about whether he was happy or sad and appeared delighted when one of the robots began shooting him with bubbles when he said he was happy. He acknowledged being more nervous about what would spew out at him for being sad, and was not too disappointed when the wireless in the lab cut out before anything happened. “Sorry you didn’t get to slime me,” he said. Trudeau was also shown several other projects combining technology with ways to address global problems such as food insecurity and public health issues. He said he is aware the fast pace of change technology brings is scary and can lead to anxiety-induced populist politics. However, Canada has made a conscious decision to push forward rather than get left behind, he added. Trudeau also took a few questions from students in the audience, one of whom asked him directly about populism in Canada. “Canada is not immune to that,” he replied, adding that anxieties about immigration and its impact exist in Canada as well.